Davey Oil in front of his family cargo bike shop in Seattle. Photo by Josh Cohen. If you ride bikes in Seattle, you likely know a bit about Davey Oil. 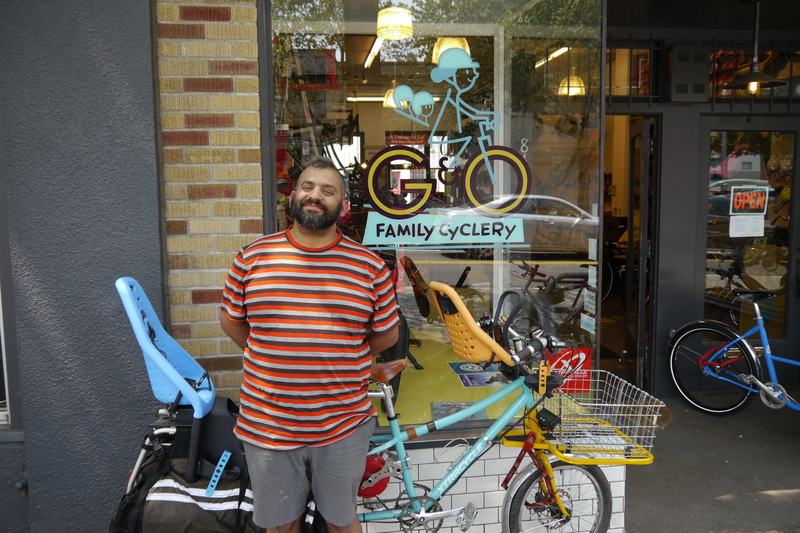 As co-owner of the family cargo bike shop G&O Family Cyclery he’s played a critical role in Seattle’s family biking boom. As a longtime bike activist, he’s worked for and been involved in Bike Works, Cascade Bike Club, the Bikery, critical mass and more. Having straddled the fence between the radical activist side of the bike movement and the insider-politics advocacy side, he has a valuable perspective on the growth of cycling-as-transportation in the city. I sat down with him at a coffee shop next to the Family Cyclery for a wide ranging conversation about his roots in activism, the rise and fall (and re-rise and re-fall) of Seattle critical mass, the mainstreaming of bike politics locally and nationally, the advocacy world’s struggles with diversity, the family biking boom, and much more.